Who is Sebastian Kurz? Meet Austria’s new 27-year-old foreign minister. While most of Europe was watching the birth of Germany’s latest grand coalition government last week, Austria’s grand coalition also finalized its government platform. 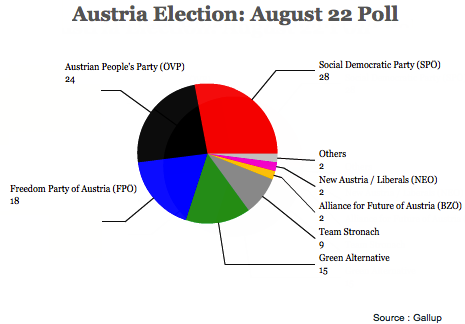 Austria, which has an even stronger tradition of cozy coalition politics between the center-left and the center right, will continue to a coalition that’s comprised of its main center-left party, the Sozialdemokratische Partei Österreichs (SPÖ, Social Democratic Party of Austria) and its main center-right party, the Österreichische Volkspartei (ÖVP, Austrian People’s Party). There was very little unexpected news about the coalition deal, which will continue the broadly centrist course of center-left chancellor Werner Faymann’s government. But the decision to elevate the hunky 27-year-old Sebastian Kurz as Austria’s new foreign minister was something of a shock. Michael Spindelegger, the ÖVP leader and deputy chancellor, who previously served as foreign minister between 2008 and 2013, will become the government’s new finance minister. The decision leaves Kurz (pictured above) as one of the world’s youngest political leaders in such a high policymaking role. So who is this whiz kid? 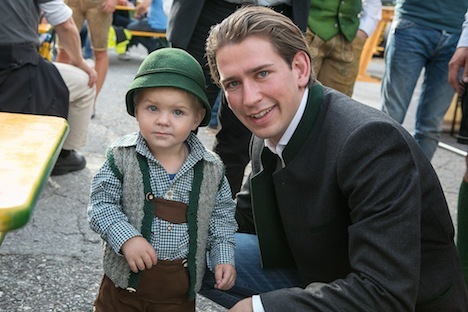 Kurz became involved in politics at age 10, and by 2009, he was the leader of the youth wing of the Austrian People’s Party. In 2010, he was elected to the city council of his native Vienna, running under the slogan, ‘Schwarz macht geil‘ (‘Black is cool,’ referring to the color most associated with the People’s Party) in a campaign Hummer that quickly gained the nickname as the ‘Geilomobil‘ (which translates roughly to ‘Horny-mobile’), befitting Kurz’s growing reputation as somewhat of a party animal. Before you judge him too harshly, however, remember that it was part of a wider push to make the ÖVP more attractive to young voters. And just four months ago, two competing leaders of the Austrian far right both posed shirtless in public. But by 2011 he was already serving as state secretary for integration, where he impressed skeptics by working to ease the path for the growing number of immigrants to Austria, including through the institution of an extra year of pre-school for immigrant children to learn German. He helped spearhead a new immigration law in May of this year that clears a path to citizenship for some immigrants within six years. It was a controversial move on Spindelegger’s part, but it paid off, and Kurz was elected to the Nationalrat (National Council), the chief house of the Austrian parliament, in the September 29 parliamentary elections with a higher number of votes than any other candidate. His approach contrasts with that of the more xenophobic approach to immigration of Austria’s far right. In September, the Social Democrats won 27.1% and the Austrian People’s Party won 23.8%, but the anti-immigrant, anti-EU Freiheitliche Partei Österreichs (FPÖ, the Freedom Party of Austria) won 21.4%, a strong third-place finish. But a Dec. 12 Hajek poll showed that if the elections were held over today, the Freedom Party would emerge as the leading party with 26%, followed by the Social Democrats with 23% and the Austrian People’s Party at 20%. 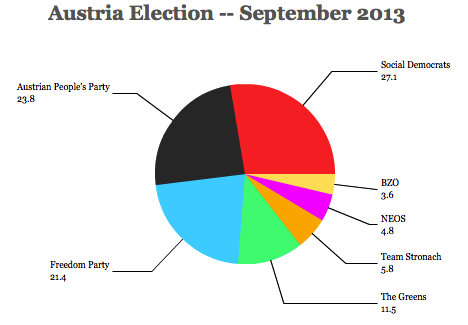 A new free-market libertarian party, Das Neue Österreich (NEOS, The New Austria), which entered the National Council for the first time in September’s elections, would win 11%. “When Mr Kurz becomes foreign minister without any diplomatic experience, you have to be amazed. This is the continuation of Austria’s farewell to foreign policy,” right-wing leader Heinz Christian Strache told parliament on Tuesday. Kurz… took the blows. “It’s true, of course. Due to my age I have limited experience and of course hardly any diplomatic experience. But what I bring is lots of diligence, energy and the desire to contribute something,” he told Reuters. But Kurz emphasized the international nature of his previous role with respect to integration, and he argued that his relative youth and high media profile would allow him to make an immediate impact. Though Austria, with just 8.5 million people, has a less dominant voice on European matters than Germany, it plays a key role in the Balkans, where Serbia and other former Yugoslav countries are hoping to begin accession talks to the European Union early next year. (If your German skills are up for it, here’s an interview with Kurz in Der Standard earlier this week). 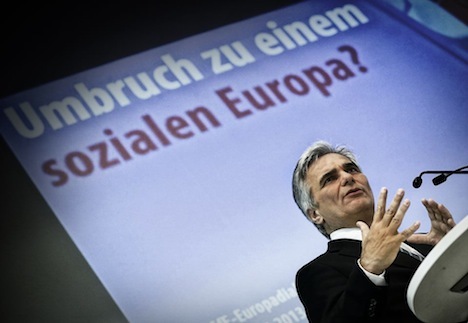 With nearly all of the votes counted in Austria’s election today, it appears that the current grand coalition led by center-left chancellor Werner Faymann will continue — for up to another five years. Just one week after Germans massively supported chancellor Angela Merkel and her center-right Christian Democrats for steering Germany largely unscathed through the worst of the economic crisis, Austrians appeared ready to do the same for Faymann, though his Sozialdemokratische Partei Österreichs (SPÖ, Social Democratic Party of Austria) did not score the kind of overwhelming victory that Merkel’s Christian Democrats won last week — the SPÖ lost over 2% of the vote since the September 2008 election. But their coalition partners, the center-right Österreichische Volkspartei (ÖVP, Austrian People’s Party), also lost 2.2% of the vote from 2008. 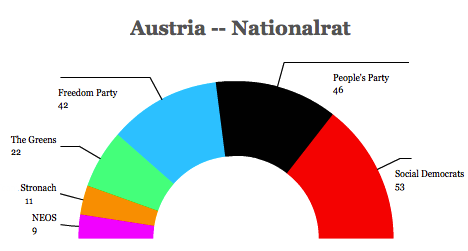 Together, however, the two parties won enough seats (99) to continue to hold an absolute majority in Austria’s 183-member Nationalrat (National Council), the chief house of the Austrian parliament. But the far-right, anti-EU, anti-immigrant Freiheitliche Partei Österreichs (FPÖ, the Freedom Party of Austria) won just four seats less than the People’s Party and it won over 21% of the vote. That’s largely because voters on the far right abandoned the Bündnis Zukunft Österreich (BZÖ, Alliance for the Future of Austria), the splinter group that former Freedom Party leader Jörg Haider founded in 2005. Believe it or not, today’s election was the first one without Haider in nearly two decades following his sensational death in October 2008, and the BZÖ lost over 7% from the 2008 election — and missed the 4% electoral hurdle required to hold seats in Austria’s National Council. Given Haider’s absence from the political scene, many BZÖ supporters turned back to the Freedom Party. 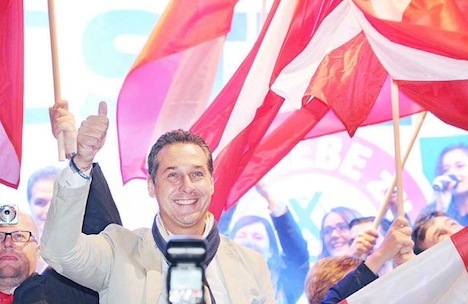 In any event, it’s certainly a huge victory for FPÖ leader Heinz-Christian Strache (pictured above), whose party gained more support than any of the parties that contested the 2008 election. Strache is one of the big winners in today’s election, and that will amplify his voice as the chief opposition leader in Austria. Austria’s parliamentary elections on September 29 will affect a population that’s just two-thirds that of the German state of Bavaria, but the campaign features many of the same dynamics as Germany’s federal elections that will be held exactly one week prior — a broad centrist consensus on economic policy, the likelihood of yet another ‘grand coalition,’ flush economic conditions relative to the rest of Europe and static polls all year long indicating a narrow center-left win. But there are key differences as well — unlike in Germany, where Christian democratic chancellor Angela Merkel is favored for reelection, it’s Austria’s social democratic chancellor Werner Faymann who will likely return as chancellor. Moreover, there’s a far-right component to Austrian politics that simply doesn’t exist in Germany. While the far-right remains divided among three competing parties (and that makes it unlikely that they will form a government), the far-right parties could cumulative outpoll the center-left and the center-right. Let’s start with the fundamentals — Austria’s economy grew by an estimated 0.6% last year and 2.7% in 2011, and though its growth this year has been virtually negligible, it dipped into negative growth (-0.1%) for just one quarter (Q4 2012), so it’s difficult to say that Austria has even suffered a recession, at least in technical terms. Although the European Union’s unemployment rate, as of June 2013, remains 10.9% and the eurozone’s unemployment rate an even higher 12.3%, Austria has the absolute lowest unemployment of all 27 EU nations: at 4.6%, Austria’s unemployment is nearly a percentage point lower than the second-lowest, Germany, which has a 5.4% unemployment rate. That means that the anti-incumbent moods that pushed out French president Nicolas Sarkozy last year and has already weakened his leftist successor, François Hollande, and that upended governments in Greece, Italy, Romania, Bulgaria and elsewhere over the past year, doesn’t have the same punch in Austria. The three far-right parties, taken together, however, attract the support of 29% of all Austrian voters — the largest, the Freiheitliche Partei Österreichs (FPÖ, the Freedom Party of Austria), is the longstanding anti-immigrant, anti-EU, extreme-right conservative party in Austria, and it was the party that the late Jörg Haider led controversially into a government coalition in 2000 with the ÖVP. But Austro-Canadian businessman Frank Stronach, who returned to his homeland last year after decades as chief executive officer of his Ontario-based auto parts company, is leading an alternative populist, eurosceptic right-wing party — Team Stronach — that’s attracting between 8% and 10% of the vote. Finally, the Bündnis Zukunft Österreich (BZÖ, Alliance for the Future of Austria), which Haider founded in 2005 when he left the FPÖ, is in danger of losing all of its seats in Austria’s parliament following Haider’s sensational November 2008 death and Stronach’s recent rise. But most recently, Stronach and the FPÖ leader Heinz-Christian Strache have made more headlines over shirtless photos than policy matters. Furthermore, in March’s local elections in the southernmost state of Carinthia, where Haider had served as governor for nearly a decade, the Freedom Party’s share of the vote dropped from about 45% to just 17%, and the Social Democrats swept to power under its leader Peter Kaiser in alliance with the Die Grünen – Die Grüne Alternative (Green Party). Nationally, the Greens are polling at around 15%, which would mark a 40% increase from their 2008 result.